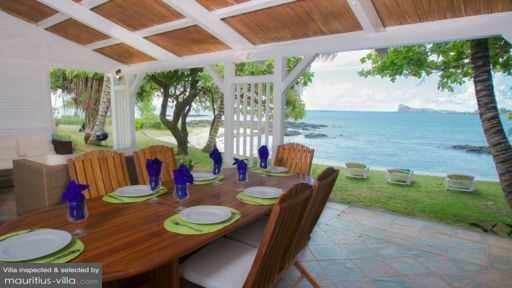 With an absolutely breathtaking view, Villa Pereybere 2 can comfortably accommodate up to 8 people, making it the ideal spot for a tropical holiday with your family and friends. This stunning villa boasts stunning Mauritian architecture and with splendid views of nearby mountain ranges. Offering an excellent view of the lagoon, this villa is all set-up to provide your own personal oasis of peace and tranquility. 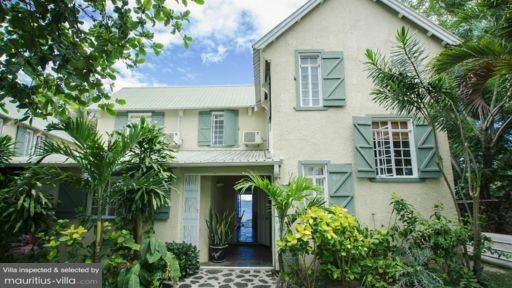 Ideal for group holidays, Villa Pereybere 2 consists of two bedrooms on the ground floor and two more on the first floor. All bedrooms are fully air-conditioned, which means that you will be able to escape the tropical heat, especially during the summer. Offering spectacular views of the great outdoors, the bedrooms at Villa Pereybere 2 all include a double bed, along with closets, night lamps, bedside tables and the likes. The master bedroom is also connected to its own en-suite bathroom which is beautifully appointed with a shower, sink, mirror and toilet. The guest bedrooms share an independent bathroom between them. Guests of Villa Pereybere 2 will be able to make the most out of the warm tropical sun as they lounge in the massive garden. 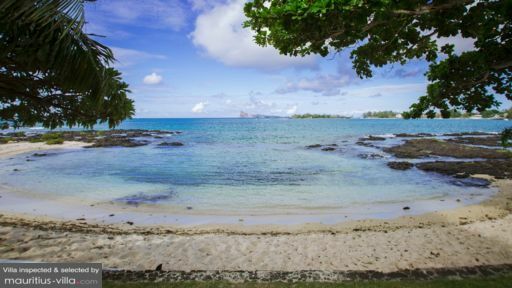 Boasting abundant tropical foliage and flowers, the garden overlooks the ocean, which means that you can enjoy a glorious view as you work on your tan. Extremely well-manicured, the garden additionally includes comfortable sun beds which you can lounge upon as you soak in some much-needed vitamin D.
Villa Pereybere 2 does not include a pool but its proximity to the sea enables you to enjoy a cool dip anytime you want. In fact, the pristine public beach is a mere 3 minutes away on foot. Towels are provided at the villa. As far as the living areas are concerned, guests of the villa will be able to benefit from a perfectly appointed interior, complete with a spacious family room. This particular room also includes a set of comfortable sofas, as well as a flat-screen television. The living room offers a spectacular view of the lagoon, which means that you will be able to enjoy a spectacular view of the sunrise and sunset. A dining room has also been set up on the wide terrace, promising delicious Al-Fresco dining with your loved ones. Because this villa is self-catering, you can also benefit from a fully-equipped kitchen, complete with sink, gas stove, microwaves and the likes. In addition, guests can benefit from the daily services of a maid to ensure that you won’t have to bother about housekeeping during your stay. By this token, you will be able to enjoy a clean and pristine environment without having to lift a finger. In fact, it is also possible to hire the services of a trained and experienced in-house cook should you want to enjoy a completely relaxing vacation. Villa Pereybere 2 is found in the north of Mauritius and is in close proximity to several reputed establishments such as casinos, nightclubs, pubs and restaurants, among others. In fact, the village of Pereybere is known for its extended range of restaurants that specialize in just about anything from fusion to local, Creole, Asian and even Indian dishes. Because the villa is found at the very heart of Pereybere, several facilities such as pharmacies, supermarkets and grocery stores are found within walking distance. If you want to explore the unique underwater scenery in the lagoon, you can also head over to the nearby Hibiscus Hotel which is especially reputed for its accredited diving center. Guests of Villa Pereybere 2 can also easily get a taxi or a bus to visit the tourist hub of Grand Bay or the nearby capital of Port Louis.